Very prompt responses and very informative with your email communication. We appreciated how responsive and upbeat the staff was and felt that the house was precisely how it had been presented to us. We loved our stay at Sandpiper Bluff and would love to stay there again next year. However, given its age and lack of A/C it is not for everyone. For our family, it was fantastic! Enjoy a historic home loved by generations and one of the best views in Orleans! Alyssa was my go to person at Nauset Rental.she was so helpful with anything we needed to know to familiarize ourself with the property. Certainly roomy enough for family reunions.Even with a rainy day,the heated pool was an asset.Three minutes drive time to Nauset Beach.!PERFECT! The staff are highly responsive, professional and always courteous. We've rented through several agencies in the past 2 decades and our experiences with Nauset Rental have always been the best. We loved a big upstairs great room, large kitchen and spacious deck. The kids could hang-out with us upstairs or go downstairs to watch a movie together. Decor is cheerful but not cluttered. Everything we needed was there. Loved that the beds were already made when we got there and we didn't have to worry about packing exactly the right linens. Our only additional(minor) request would be a dining table big enough to seat 8. We'd highly recommend for a family get-away. Very Professional and extremely friendly. Timely response to questions. Timely reminders. Good information on requirements and expectations. Excellent location. Beautiful main room, great kitchen and outstanding views. Responsive owner. We have traveled to the Orleans/Eastham area for 10 consecutive years. All our rentals have been good; this was the best for the money. All of the details are spelled out in advance. We appreciated the prompt feedback when we had questions. Great experience from start to finish! This home was perfect for our family of 5. We had enough space to spread out in different areas of the house. We absolutely loved the location and biked to the beach several mornings and evenings. This clean spacious home allowed us to have the perfect family vacation. We hope to be back again! Everything went smoothly, communication was great. Very nice well maintained and appointed rental. The space was just the right size, open, yet private. Perfectly located near our favorite beaches, short distance to well fleet or Truro center and close enough to P-town. We loved our stay, we were blessed with perfect weather, and the accommodations were extremely comfortable, we wanted for nothing. Perfectly supplied kitchen, nicely furnished and very well designed space. The staff of Nauset Rental were extremely professional and responsive to all inquiries. A true pleasure to work with Nicole, Alyssa and Devin - thank you all! 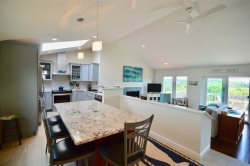 My family very much enjoyed all the Beach Charmer had to offer, spacious inside and out, a welcoming and relaxing home and great location for morning walks to Nauset Beach. Nauset Rental does an excellent job communicating! We appreciate the attention to detail in listing accuracy, photos, and follow-up. Nauset Overlook is Fantastic! No better word for it! It had everything we needed. The place is a gorgeous, very clean, well-loved home. There is plenty of space for everyone to relax, a beautiful pool and you can't beat the view! Thank you for allowing us the privilege of enjoying your home and your fantastic view! We had a wonderful time! Communication included all pertinent information, easy to reach, very easy to work with. The house is clean with a lot of room due to the large basement/lower level. Open dining and living room with sliders is perfect for viewing the lake. Lake access with sandy beach was amazing, allowed us to enjoy Crystal Lake anytime we wanted. We loved it, hope to be back in 2 years. Thank you!! Great communication about a wifi problem which was eventually resolved. Our family had a wonderful stay at Sea Turn. The house was very spacious and the distance to the beach was great. We could hear the waves from the porch especially at night. We would love to come back! Excellent rental sites. Our assistant was more than helpful. Alesha, please excuse the sp. Exceptional view. Easy access to Nauset Beach. You will be between NausetTown Beach and the Town Cove Inlet. Our first afternoon I was reading in the Great Room and was delighted to see Whales spouting continuously about 300-500 yds offshore. We later learned via Goose Hummock that they were Right Whales, an endangered species. We rented in the spring and are returning this fall. Great area to walk Nauset. Too many seals to catch fish in the Spring.I'll try again in the fall. Enjoy! Staff was very helpful and friendly. Arrangements were professional. House was very clean upon arrival and staff is very friendly. Amazing property, owner was super friendly and quick to respond to issues or questions.